YWCA Leader Luncheon: Congrats to the YWCA Leader Luncheon recipients: City of Elgin’s Amanda Harris and Christen Sundquist, Guadalupe Fonseca of the Greater Elgin Family Care Ctr, Amanda Garcia of ColorWord Creative, Hanover Park’s Eira Corral Sepulveda, Congregation Kneseth Israel’s Rabbi Margaret Frisch Klein, Community Crisis Center’s Dr. Kimberly Schellin-Rog, Joann W. Hartmann of Food for Greater Elgin, and The Grand Victoria Casino for the Corporate Award. Elgin Community College: Congratulations to Dawn Munson, EdD, professor of education who recently received the American Association of Community Colleges’ (AACC) Dale P. Parnell Distinguished Faculty award. The award recognizes faculty members who make a difference in the community college classroom. School District U46’s welding lab at Elgin High School is now a certified testing facility - the first in the midwest and among only three high schools in the country to be accredited! The program is sanctioned by the American Welding Society allowing students to obtain professional certification meeting industry standards. The Gail Borden Public Library is "diving into reading" with the summer reading program complete with sea creature’s characters, giant photo opportunities for participating children and fishing for prizes! More than 13,000 summer reading logs have been delivered to all grade and middle schools in the district to encourage students to participate in summer reading through the “Extreme Deep: Mission to the Abyss” program. The Elgin Valley Fox Trot, a spring tradition for runners and walkers, took place on the Saturday of Memorial Day weekend. This event provides the opportunity to get some quality exercise, cheer on friends and family, and/or raise money for local non-profits, while enjoying the scenic course which winds through Elgin’s downtown, parks and historic neighborhoods. 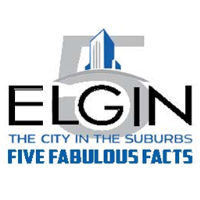 Thanks to the City of Elgin for sponsoring the 41st annual Fox Trot!